Nothing says summer like a refreshing Pasta Salad. I love this salad since I can prepare it ahead of time and it is filling enough to serve for dinner. Yum! Cook pasta as directed on package. Drain. Rinse with cold water to cool; drain well. In a large bowl combine mayonnaise, sour cream, ranch and southwest seasoning mix well. Toss in your cooked pasta and then add tomatoes, bell pepper, green chilies, chicken, and cheese. Serve immediately, or cover and refrigerate until serving time. Sprinkle with green onions before serving. Enjoy! I have had bow tie pasta on my mind, and here is your delicious recipe. Thanks for including it at Foodie Friday. Hope you have a great weekend! 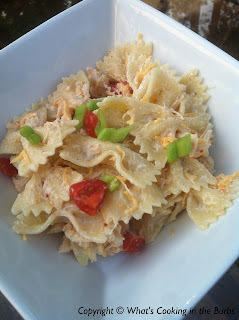 Pasta salad recipes are my favorite! Pinned it! This sounds perfect for our hot summers in Phoenix. Thanks for including the nutrition info as well! This sounds good. Nice and fresh. Good idea for a weekend dinner after the garden. Thanks.